Ottoni Fabbrica Italian Top Kettle “Fjord Satinato” 2400W 1,7 L has the following specifications FJORD SATINATO 2400W electric kettle, made entirely in 18/10 stainless steel with a polished, satin-finish surface. Lime scale filter. The parts are all made in Europe, including for example, the steel and the heating element, which are made in Germany. Certified by the IMQ, organisation recognised at European and international level by the main certification bodies and organisations. Carefully hand-finished spout. Cordless device with capacity of 1.7 l. Minimum fill amount, 0.5l, maximum 1.7l. Filling diameter: 125 mm. Complete with automatic switch off and safety cut-out. 360° rotation. Practical ambidextrous handle. 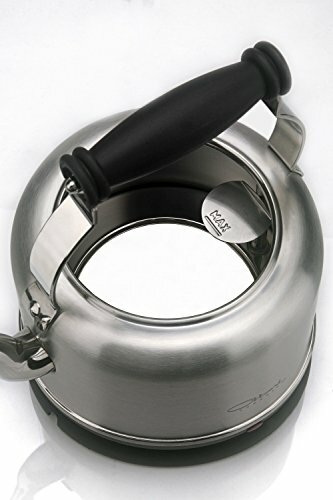 Electric kettle made entirely in 18/10 stainless steel MADE IN ITALY. The parts are all made in Europe. Posted in Electric KettlesTagged "Fjord, 2400W, Fabbrica, Italian, Kettle, Ottoni, Ottoni Fabbrica, Satinato"